The “Legends in Concert” presented a grand old-style Las Vegas VIP/Press opening was quite an event, a chance to see all four- Elvis, Sinatra, Lady Gaga, and Whitney Houston- Tribute Artists before their show as they posed for pictures on the red carpet. The food served during the pre-show party reminded me of the feasts when I attended the Las Vegas show’s press opening night parties of the 80’s and 90’s. Tonight we enjoyed serve-yourself lobster, large shrimp, and oysters at the entrance to the Trago Lounge. They even added several more locations at each of the corners of the large bar throughout the room each with different selections of food, tasty appetizers, make-your-own sandwiches, and luscious desserts. This party was a great way to spend an hour before the show began! Tierney Allen portrayed one of the most riveting interpretations of Lady Gaga’s famous hits, very strong in character while quickly switching with the right emotion and mood for each of her selections and a great mix of songs. Of course Tierney included a beautiful rendition of Lady Gaga and Bradley Cooper’s recent Academy Awards number and with all of the publicity this song really stood out! 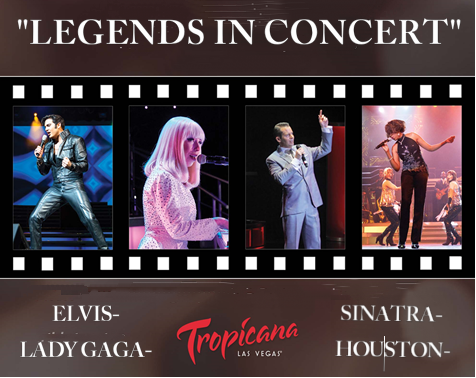 “Legends in Concert”, Telephone: 800-829-9034, Tickets: $49.99-79.00. 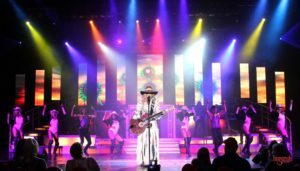 Legends in Concert is celebrating 35 years of success this year and claims the title of longest-running production show in Las Vegas. Owned and operated by On Stage Enterprises, Legends in Concert debuted at Imperial Palace Hotel and Casino in 1983 and later moved to Flamingo Las Vegas in 2013, in conjunction with the show’s 30-year anniversary. As an award-winning television producer, I have produced travel specials around the world. I visited China five times and produced two travel specials, one in Beijing and another on the Yangtze River Cruise, in addition to reviewing restaurants and shows, journalist for 20 years.